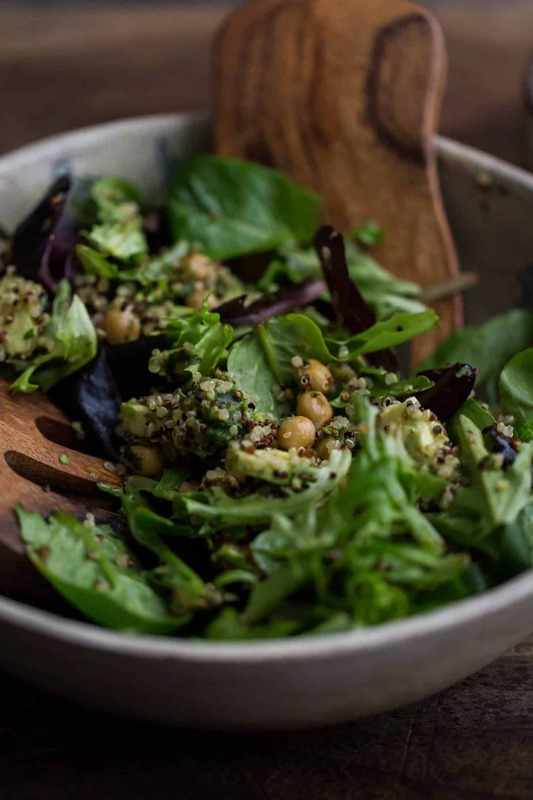 Green Harissa Chickpea Avocado Salad | Naturally. As with most marriages, M and I have our running jokes. One of which revolves around M and his love of all things sauce. The biggest complaint I hear from him is that I don’t cook enough things with sauce. And so, over the years, I’ve built an arsenal of sauces, like the green harissa used in this recipe. This particular sauce is fresh and tangy- a perfect companion for avocado and lettuce. The key to this sauce? Fresh herbs and a quality olive oil like California Olive Ranch’s Arbosana Olive Oil. 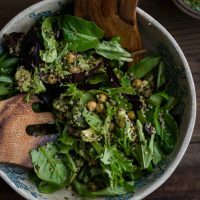 A hearty vegan salad made from fried chickpeas tossed with homemade green harissa. Make harissa according to directions. Set aside. Heat a skillet over medium heat. Add the olive oil, followed by the chickpeas. Fry the chickpeas until they are browning and starting to pop, 5 to 6 minutes. Reduce the heat, add the ⅓ cup of harissa and cook for another minute, just to warm the harissa. 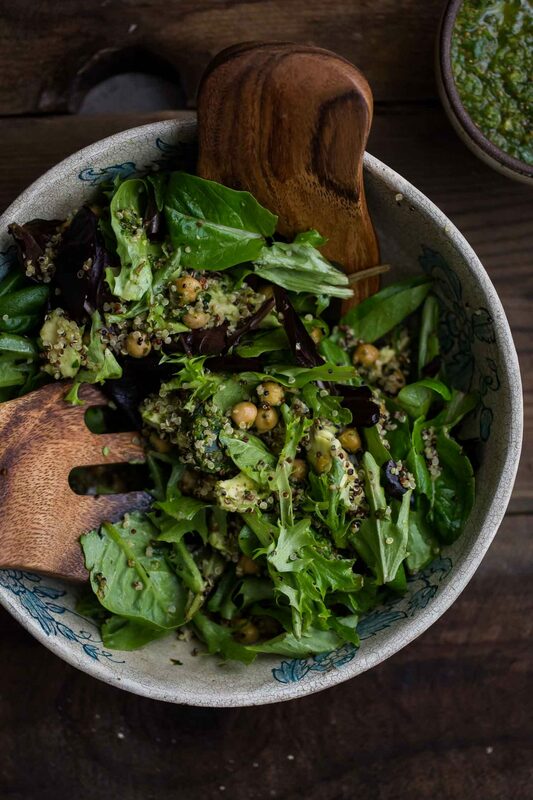 Assemble the salad with the lettuce, cooked quinoa, avocado, and fried chickpeas. Add a drizzle of fresh lemon juice or more harissa to the salad as desired. Tips & Tricks: The recipe for harissa makes a generous amount. You can scale back the recipe but I recommend making the full recipe and using the sauce with grain bowls, eggs, and as a topping for soups. The focal point of this recipe is definitely the green harissa chickpeas. There is something lovely that happens when you pan fry chickpeas and toss them in a tangy sauce. I could easily eat these chickpeas on grain bowls, with eggs, or on top of hummus. Grains: I like using quinoa in salad because of the quick cooking time. However, any grain would work well in this salad. Go for something heartier, like sorghum or einkorn or something more flavorful like buckwheat. I also like pan-frying sprouted grains with the chickpeas. Greens: Swap out the lettuce for spinach or kale. Kale is lovely with the chickpeas as the warmth helps to soften the greens just slightly. Additions: Roasted sweet potatoes and squash are wonderful during the winter months while fresh tomatoes are perfect in the summer. I traditionally use California Olive Ranch’s Arbequina Olive Oil is sauces like harissa and pesto. However, I found with this particular harissa, I liked the nuttiness from the Arbosana. It’s also my olive oil of choice for drizzling on homemade hummus (a must). Of course, you can’t go wrong with their everyday oil! Where can I find a recipe for harissa? Thanks. Love this salad. 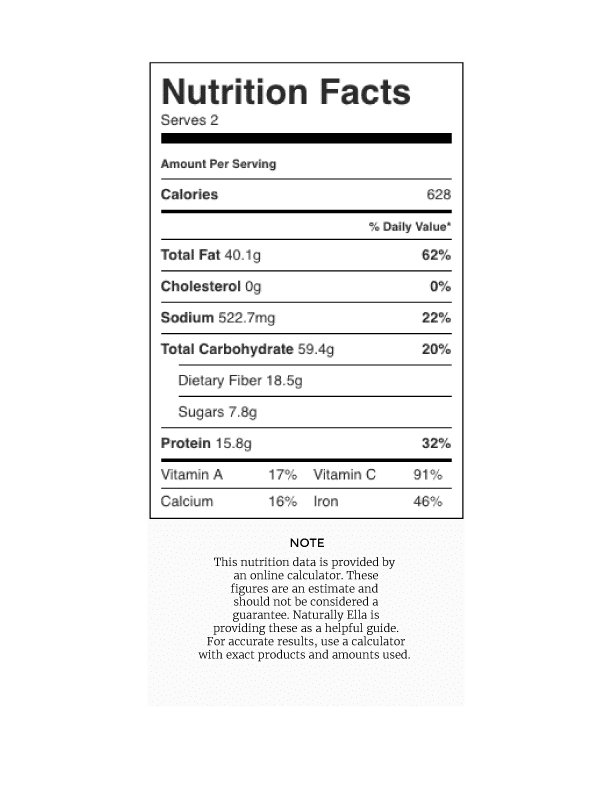 It’s very straightforward and full of flavors.! How long does the harissa last if stored in the fridge? I’ve had it up to about a week without trouble. Haha, I love that your husband is obsessed with sauce! I think French chefs around the world would be quite pleased to hear that because they, too, are obsessed with their sauces. 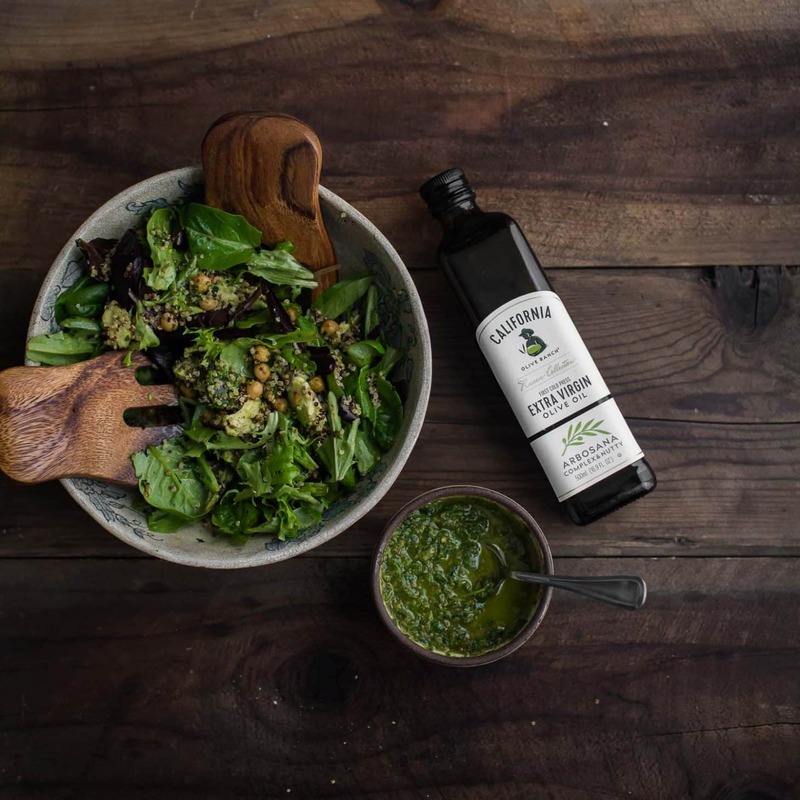 California Olive Ranch is actually one of my favourite brands for everyday olive oil! I love your technique of frying the chickpeas, sounds delicious especially with the flavorful sauce!